This week’s The Book Diner interview is from the archives, but I’m proud to share it again on my new site as it’s not often you get to talk to a bestselling author – and especially not one I sent a fan message to! I first became a fan of Sarah’s work when my cousin gave me One Moment, One Morning and I was so moved by it that I sent Sarah a message on Facebook, hoping the fact we had a mutual friend – our fellow Brighton author, Hattie Gordon – would make me seem a little bit less like a stalker! Since then Sarah has been a wonderful source of support for me, both professionally and personally, especially as I rode the rollercoaster towards publication and fought through a particularly nasty bout of depression last year, following a major loss. 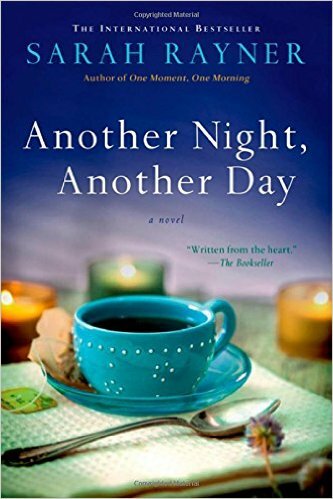 Sarah herself has been very open about her own struggle with anxiety and her latest novel, Another Night, Another Day explores the theme of mental health in the way only Sarah’s writing can – as with One Moment, One Morning, she takes what should be a very dark subject matter and injects tender humanity and gentle humour. I agree with Sarah that great stigma still exists around mental health difficulties, even though one in four of us will suffer with them during our lifetime. Hence I greatly admire Sarah for tackling this topic in her work and very proud indeed to interview her on my blog. A latte for me please, and a piece of that lemon-drizzle cake on the counter. It looks yummy. My new novel is published on July 17th, although it’s available now exclusively in Waterstones. It’s called Another Night, Another Day and is about three people, each crying out for help. There’s Karen, about to lose her father; Abby, whose son has autism and needs constant care, and Michael, a family man on the verge of bankruptcy. As each sinks under the strain, they’re brought together at Moreland’s Psychiatric Clinic. Here, behind closed doors, they reveal their deepest secrets, confront and console one another and share plenty of laughs. Another Night, Another Day is connected to my bestselling novel, One Moment, One Morning and the follow-up, The Two Week Wait, as it’s also set in Brighton and features some of the same characters – readers of One Moment may recognise Karen as the woman whose husband died suddenly on the train to London. But, like Another Night, Another Day, it is a complete stand-alone novel, so there’s no need to have read either of the two previous books to enjoy this one. What inspired you to write Another Night, Another Day? Where do you generally draw your ideas from? I’m often been asked if my novels reflect my own life and the honest answer is, ‘Of course they do.’ That doesn’t mean my books are autobiographical: they’re not. My circumstances are not identical to those of Karen, Abby or Michael in Another Night, Another Day. I’m not a widow, like Karen, nor do I have a child with autism like Abby, or run a florist like Michael. However, I do have first-hand experience of crippling anxiety, and it’s this that motivated me to write the book, which also touches on depression, bipolar illness, even suicide. But whilst it deals with tough subjects and is sad at times, it’s not depressing overall. I was keen to show how people can get better if they get the right help and support one another. Yes, very much so. The Bookseller described the novel as ‘written from the heart’ and they were right: mental health is something I feel passionately about and I hope that passion comes over in my writing. I believe that mental health should be taken as seriously as physical health because the problems of mental illness are very real and immensely painful, yet by and large it isn’t. Too often sufferers are told to pull themselves together or snap out of it. This is partly because the symptoms are often not visible, but it’s also because the topic is still hard for many of us to talk about. And yet mental illness is something that touches all of us. I’d like readers to see that Michael, Abby and Karen are not bad people because they experience anxiety and depression; they’re just people. They’re people on a continuum, who I hope don’t seem that different from me or you or my readers. They laugh and cry. Tell jokes and get angry. Support one another and learn to cope. And if reading about them helps lift the lid on the subject of mental health, just slightly, so a handful of people feel able to talk more freely or others feel a touch more understanding, then the time I spent writing the book will have been worthwhile. I research widely to flesh out my own understanding. I read nonfiction books connected to the subject of whatever I am writing about, scour the web and if I’m in doubt about something, I ask for help and input from others with more expertise. I try not to abuse my family and friends in doing so though – I’m very open and ask if I can draw on their expertise. In creating Abby’s story, for instance, I worked closely with a dear friend of mine, Cath Newell, whose son, Axel, is a bit like Callum. I spent time with her and her family, went to Axel’s school and Cath read my manuscript to make sure it was as accurate as possible once I’d written the first draft. However, I’m quite clear that Abby isn’t Cath – Cath is more self-aware and steely, so better able to cope than Abby with a situation that in many ways is similar. I see writing a novel like mixing paints on a palette; I might choose a little bit of yellow from my life, a swoosh of crimson from a friend who’s shared his or her insights, then add a touch of cobalt from background reading and a smidgeon of black from online research, blending them together to create a narrative. Moreover, whilst some of my inspiration comes from my own past, this doesn’t necessarily mean it’s deeply personal – only now do I realize Karen’s curtain of chestnut hair came from the character of Crystal Tips in Crystal Tips and Alistair, a children’s TV show from the 1970s, for instance, but I don’t believe that’s hugely significant. So to answer your question, I don’t worry excessively about baring my soul as by the time a novel is finished it’s impossible for me to know precisely what’s ‘my’ soul and what’s come from elsewhere. What I do dearly wish, however, is that as someone reads Another Night, Another Day that they might see themselves reflected in some of what Karen, Abby and Michael go through. At the start of the novel Karen’s elderly father is seriously ill, an emotional experience that is sadly bound to resonate with many people. From here – if you’ll forgive my adding an audio to my painterly metaphor – I turn the volume up and brighten the colours; so what happens to Karen as the novel progresses might be brighter, deeper, faster, louder – indeed, better and worse – than reality. But hopefully, because she started somewhere not too far removed from our own lives, we can learn from her experiences as she does, and grow a little, with her. Whilst I imagine other authors might say nice encouraging things like ‘try, try again’ and ‘it took so and so thirty rejections before their work was accepted and now she’s a bestselling author,’ I would say, Learn to hone your writing. Edit and re-edit your work so you avoid repetition and clichés. Keep your viewpoints consistent, check your tenses don’t jump about, and take a hatchet to superfluous passages when need be. I get asked to read a lot of stuff – goodness knows what agents and editors get – and a lot of it is lazily written. Would-be novelists should learn to be tough on themselves. Another useful tip is to start with short stories. Twenty years ago I was advised to do this by a published author and it taught me a lot about dialogue and structure. I had several short stories published in women’s magazines before I attempted a full-length novel. Otherwise, it’s rather like trying to run a marathon without ever having jogged a mile. Thanks so much for joining us, Sarah – please call again!